French Philosopher Jean-Paul Sartre acquired celebrity status mostly thanks to his literary and theatrical productions during the middle to late 1940s. He is still widely associated with Parisian café society, an unconventional life-style and provocative political stands. He remains the only person to turn down the Nobel Prize, which was offered to him in 1964. He opposed the French colonial war in Algeria, supported war resisters and risked arrest by taking part in illegal demonstrations. Later he opposed the Soviet invasion of Hungary in 1956, and in the 1960s denounced the Vietnam war. Sartre scholar Maria Antonietta Perna looks at a new introduction to his writings. Robert Bernasconi has tackled the Promethean task of condensing the writings of one of the most prolific among the great philosophers of the 20th century into under a hundred pages. Bernasconi, a widely recognised expert in Continental philosophy, seems acutely aware both of the tortuousness of Sartre’s prose and of the arduous task of conveying his thought through a limited selection of extracts. Each extract is accompanied by a mini-lecture which aims to set the text in its appropriate context, to provide links with other philosophers’ ideas, and to explain the core ideas. Granta’s How to Read guide encompasses both the very early work written during the mid to late-1930s and those belonging to his later, dialectical phase. Bernasconi does not shirk from the task of dealing with some of Sartre’s most difficult ideas. The first chapter, I Too Was Superfluous, presents the well-known episode in Nausea when Roquentin, the protagonist in the novel, experiences the lack of intrinsic meaning, which Sartre calls the “contingency” of existence, while looking at a chestnut tree in the park of the provincial (fictional) town of Bouville. There are scholarly references to Sartre’s notion of contingency and theoretical connections with Sartre’s later philosophical masterpiece, Being and Nothingness. Outside, In The World, Among Others presents the short essay Intentionality, which is Sartre’s earliest attempt at producing original philosophy. Bernasconi’s discussion enlightens the reader as to the philosophical co-ordinates of Sartre’s earlier thought. These were Descartes, Bergson, and, especially, Husserl and Heidegger, who provided the inspirational sources for Sartre’s turn towards the phenomenological method in philosophy. Hell Is Other People is just one example, perhaps the most widely recognised one, of the kind of catchy slogans with which Sartre’s works are often sprinkled. It is taken from the play No Exit, which was successfully shown in Paris for the first time in 1944. The battle between Self and Other raging on stage smoothly leads up to He Is Playing At Being A Waiter In A Café, which tackles a major theme of Being and Nothingness and of Sartrean philosophy as a whole, namely, “bad faith”, or as some, less appropriately in my view, call it, “self-deception”. Discussion of Being and Nothingness continues in In War There Are No Innocent Victims. Bernasconi clarifies what he considers as Sartre’s view of the relations between “human reality” and its situation, between freedom and constraints, and, the place of responsibility within this framework. As Bernasconi points out, such notions provide the unifying thread in Sartre’s developing thought and acquire ever more richness as he begins to struggle with, and eventually elaborate, his own view of dialectics. The Authentic Jew Makes Himself further confirms Sartre’s involvement with socio-political problems. I would like to remark that during and soon after World War II the horror of the Holocaust had not entirely sunk in: it was still kept at the periphery of public debate and the plight of the Jewish people was by and large being ignored. By writing Anti-Semite and Jew in 1944, Sartre broke the silence, although the complete version of the essay was published only in 1946. Bernasconi does mention the many criticisms with which this essay was received and Sartre’s ignorance of Jewish history. However, he also insightfully points out that the focus of Sartre’s argument was not scholarly or historical, but it was part of his project of engaged philosophy. The conflictual dynamic between the Jew and the anti-Semite is grounded in the battle between Self and Other as illustrated in Being and Nothingness. But the novelty with respect to that earlier work consists in the fact that more weight is now put, quite significantly, on the constraining impact of the world, as an essentially anti-Semitic world, on the self-choice and possibilities for action of the Jewish people. 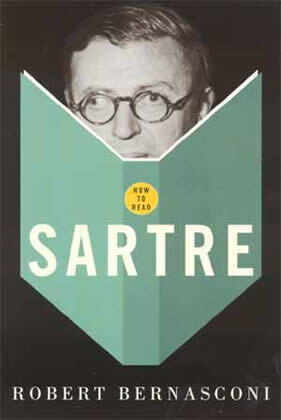 Bernasconi rightly notes that “Sartre’s essay is not to be understood as an academic study, but as a dramatic intervention relating to a pressing problem of the moment. It was one of the first of many occasions when he would show how his philosophy had the power not only to illuminate reality, but to work towards changing it”. The Eyes of the Least Favoured discusses and contextualises Sartre’s controversial defence of the Communist Party as it is articulated in Communists and Peace, the first part of which appeared in July 1952 in Les temps modernes, the magazine founded by Sartre and Simone de Beauvoir, his life-long companion. “You cannot fight the working class” – Sartre writes here – “without becoming the enemy of men and of yourself.” As things appeared to Sartre at the time, one could not be on the workers’ side and at the same time be against the Communist Party. Bernasconi once again brings to light the shortcomings of the Critique, such as its lack of clarity and occasional repetitions. However, he perceptively recognises the work’s tremendous theoretical import and does not hesitate to refer to it, most appropriately in my view, as a “masterpiece, perhaps the great work of political philosophy of the twentieth century”. Bernasconi’s is an excellent introduction. Key concepts are explained in a user-friendly manner. The continuity and development of Sartre’s thought is explained in line with the emerging and deepening of his concerns for the socio-political situation of his days, and the original texts are thoughtfully selected and insightfully expounded. Just one reservation: some complex ideas might have benefited from more in-depth discussion. Bernasconi’s scholarship has been sacrificed on the altar of accessibility, at least in some places.